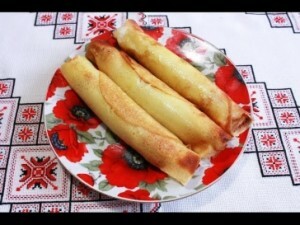 Nalysnyky – the thin pancakes with curd/cottage cheese stuffing rolled up to form a tube and fried to a golden crisp. 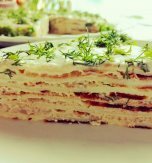 In ancient times the pancakes were baked in Ukraine on the metal sheets and that is the reason why this dish got this name. Today we are going to cook these amazing pancakes with cheese and vanillin stuffing. 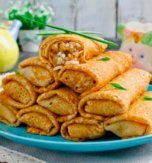 You can stuff nalysnyky not only with curds but also with meat, mushrooms, any sweet filling – jam, caramelized milk, marmalade or fresh fruits and berries. 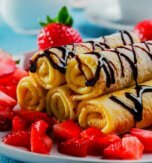 You may also experiment and roll the pancakes (as roll-ups or triangles). However, the traditional nalysnyky are rolled up in the form of a tube. In that way, you can see the shift of the dough and filling layer. It is better to use home-produced chicken eggs and homemade curds for the stuffing. Puree curds twice. Crack an egg. Separate white of the egg and yolk. Combine curds, salt, yolk and vanillin. 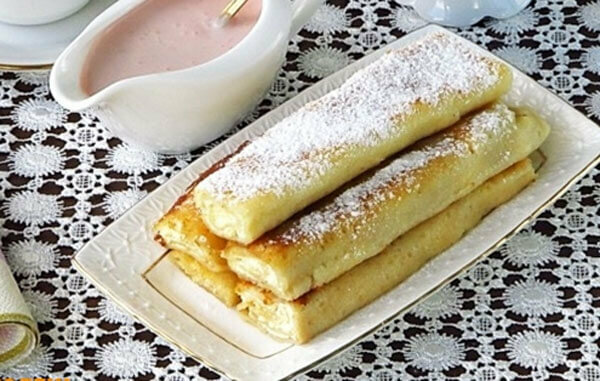 If you want to cook sweet nalysnyky then you can add some sugar. Rub everything carefully in order to get the homogenous mass. Dough should be prepared in 2 stages. First of all knead the dough with a stiff consistency and leave it for 15 minutes and then break it up to a thinly liquid condition. Separate yolks from whites of the eggs. Place yolks and sour cream in a deep bowl. Mix the ingredients thoroughly. Then add salt, sugar and milk. Mix everything again. Sift wheat flour and add it to the mixture. Knead the dough until you get stiff dough with homogenous consistency. Cool the whites and whip the eggs into the perfect airy foam. Add them to the dough. Mix the mass carefully from the bottom up by the help of a paddle (do not whip in order not to let the whites collapse) and leave it for 15 minutes. Pour cold boiled water to the stiff dough until it gets thinly liquid condition (as kefir). Fry the pancakes in the red-hot and greased with oil frying pan. Do not overturn them. Whip the remaining eggs and grease the pancakes with them. Place the curd mass above nalysnyky and arrange the stuffing evenly. Roll the pancakes and fry them all round on dairy butter till golden color. Cut the prepared nalysnyky in half diagnolly. Top them with custard sugar. Serve the dessert with sour cream of homemade yoghurt with berries. Also you may serve jam separately. 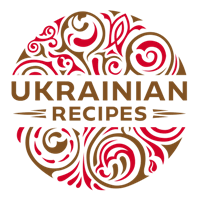 Do you have a favorite Ukrainian recipe for pancakes with cheese and vanillin stuffing? If so, please let us know in the comments below or write us an e-mail.